This is Pom-Pom fringe and it almost drove me to insanity. 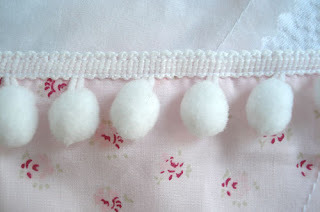 Diana and I finished the curtains for the baby's room, and i decided i wanted to put pom-pom fringe along the sides to add a little flair. We went to JoAnn's and bought 4 yards of it. It wasn't enough. Later that same day i went back to the same store and the pom-pom fringe had SOLD OUT in the 4 hours that i was away from the store. What? There were like 40 yards left! Oh well. In the 2 weeks that followed, i attended and called every JoAnn's fabric store within 50 miles of my apartment asking if they had white pom-pom fringe in stock. All the stores were out of it, but they had every other color known to man in stock. Did i miss national white pom-pom fringe day or something? I made one last ditch effort today to see if a new order had come in. No dice. It was time to bring in the big guns. My mother-in-law is the queen of craftiness and she lives in Provo, Utah... the capital of craftiness (okay, that might not be true but close enough). Within minutes of learning of my predicament she was browsing through JoAnn's and found white pom pom fringe!!!!! There are now 2 yards of pom-pom fringe on its way here. I couldn't thank her enough. It was a pom-pom fringe miracle. I know the minute i get that package there will be white pom-pom fringe in every JoAnn's in california... thats just my luck. Thanks MIL you have saved my curtains! well, i am just so glad your mother-in-law was able to find you some! sounds like your little girl's room is going to be darling. can't wait to see pics! Phew! I can't wait to see the finished product. I saw that you just read the Potato Peel Pie Society. How did you hear about it? We are supposed to read it for book group and I've been waiting for it at the library. Do you own the book or did you check it out?